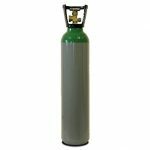 We will save you money by charging a returnable deposit of much less than one year’s cylinder rental charged by many other argon suppliers. Once you have paid your deposit only ever pay the fill cost, when you no longer require the cylinder you can return it and we will refund a percentage of the deposit dependent on the length of time you have kept the cylinder. We supply 10 and 20 litre bottles. Pure Argon – Mainly used for Aluminium and Stainless Steel. All our cylinders are filled to 200bar ensuring excellent value for money, look out as many suppliers only fill the cylinders to 130bar meaning you lose out! As Essex largest independent industrial gas supplier we supply almost 2000 across Essex, Suffolk east London and the M11 corridoor. With 20 years experience you can trust our commitment to provide you and your business with superior value and service. Established in 2001, Essex Industrial Gases is located in the heart of the Essex business district. The EIG team is a fantastic combination of skill and experience with our Directors boasting more than 40 years of total experience in the gas industry.